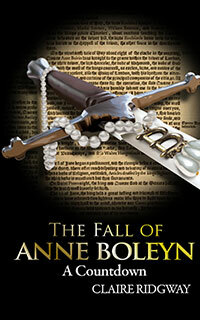 More information in my book, The Fall of Anne Boleyn: A Countdown, available at Amazon US and UK. I recall this scene very well in both the Tudors and the Other Boleyn Girl and there is a Victorian romantic portrait that captures this good bye to Elizabeth and her attempt to get Henry to see sense. With Elizabeth in her arms Anne goes to Henry and begs him to give her and their marriage one last chance, for the sake of Elizabeth. Whatever Henry’s feelings about Anne, he was very fond of ‘his Elizabeth’ who looked very much like Anne. She also had Tudor whit and intellect and red hair and temper. Anne had her baby in her arms and she begged him to listen to her, but he must now have been told ‘the truth’ for he could not and would not. Anne must have realised that she was in danger and heard of the arrest of Mark Smeaton. She must also have feared the worst, and wanted both to say farewell to her daughter and to beg Henry to recall that once he loved her, for the sake of their daughter. A very sad, but beautiful, lonely scene. Apparently we don’t know exactly what was said, other than the Queen was “entreating” Henry. Anne may have known much more than we realize. I suppose this argument may not have had anything to do with approaching events at all, they did seem to have a lot of ‘tiffs’ in their relationship. Could have been provoked by Henry, to keep his momentum up for the start of the end…..Something that we will never know I guess.